Ian Sinclair's Build Your Own books have established themselves as authoritative and highly practical guides for home PC users and advanced hobbyists alike. 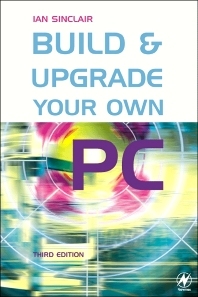 All aspects of building and upgrading a PC are covered, making this the book the computer retailers don't want you to read! By getting to grips with the world of PC hardware you can avoid the built-in obsolescence that seems to be part and parcel of the fast moving world of PCs, and escape the need to buy a new PC every year. You can also have a PC that keeps pace with the ever increasing demands that new software applications place on your system. By reading this book PC owners will get to grips with the world of PC hardware and can avoid the built-in obsolescence that seems to be part and parcel of the fast moving world of PCs, and escape the need to buy a new PC every year. The new edition of this book is based round building and upgrading to the latest systems such as Pentium 4 or AMD Athlon motherboards running Windows 2000 / ME. As well as guiding users around the inside of their PC base unit. The book also covers monitors, printers, video capture, DVD drives, USB and parallel port accessories, and much more. According to a New York Times article it is estimated that between 2000 and 2007, 500 million computers will become obsolete. The National Safety Council estimates that by 2004 315 million PCs will be obsolete. Two points that highlight how most people are unaware how simple the process of upgrading their own PC is. PC users seeking guidance on the hardware side of their system: upgrading, hardware troubleshooting, and even construction of a full system. Also suitable for hardware-based vocational education and training courses. According to C Net there are 165 million people who who have access to at least one PC. Preface; The PC machine; Casings; The motherboard and its fittings; Drives; Adding boards; Connections; Connnecting it all up; Preparations; Upgrading; The operating systems; Sundry hardware items; Junior league upgrading; Appendices; Index.